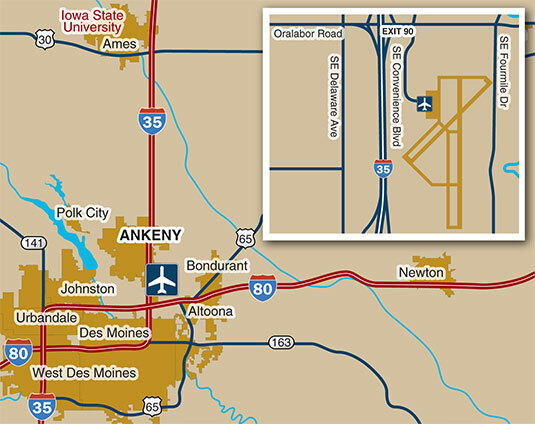 Ankeny Regional Airport serves executive and corporate travel, freight operations and general aviation in the Des Moines metropolitan area. The Airport's location at Interstates 35 and 80 offers quick access to Des Moines, Ames and Central Iowa. The passenger terminal provides a comfortable and smooth transition to ground transportation. Reliable flight support services and the safety of two runways make Ankeny Regional a preferred destination for corporate flight departments and private pilots.